Every time you open a new tab you are bombarded with “Best [TV, sports, news, etc.] Moments of 2018!” At this time of year, it’s unavoidable. While some lists are appropriate – such as the worst sports ?blunders of the year, or best dressed of the year – others require some more time to truly showcase significance. That’s why we’re back with the Sixth Annual (?) Year in Review (100 Years Later) Bracket. As in year’s past – which you can read here – we have omitted any event associated with the First World War. This is because our friends at Canada’s First World War provide excellent insights into War, and events from the War would have dominated the Bracket. It is a safe bet to say that the Armistice at 11am on 11/11/1918 would be the most significant event had we not omitted the First World War. Similarly, we have decided to eliminate from contention topics that have won in year’s past so as to not have repeat winners. As an example, women’s suffrage in Denmark won for 1915, so women winning the right to vote in subsequent years have not been included. Aaron: As Sean astutely argued in 2016, time is very much a human creation. Our planet spins on its axis as it revolves around the sun; but the measure of time it takes for one revolution – 23 hours, 56 minutes, 4.0916 seconds – is entirely a human creation. I will not delve into the philosophical debate about “what is time”, but suffice to say time is useful, especially since it helps to regulate aspects of our lives. Greenwich Mean Time was established in 1675 to assist sailors in determining longitude at sea; the first standard time was introduced in Britain in 1847 for use on railroads. Here in North America, Canadian and American railroad companies instituted a standard time in 1883, which improved both communication and travel. However, not everyone got on board with these time zones. That’s why in March 1918, the United States Congress passed the Standard Time Act, which implemented both Standard time and Daylight Saving Time across the nation. The act gave the Interstate Commerce Commission the responsibility of defining each time zone. The impact of standardizing time across the United States, as well as clearly defining time zones, has undoubtedly had significant positive impacts, especially with increased trans-continental communication and trade. Few figures in the English-speaking world are as revered as Nelson Mandela. Born Rolihlahla Mandela, a Xhosa term that colloquially meant “troublemaker”, he was given the English name “Nelson” by his schoolteacher. He reminisced in 1994, “Why this particular name, I have no idea.” Mandela was the first in his family to attend school; he eventually studied law at the University of Fort Hare and the University of the Witwatersrand. While living in Johannesburg, Mandela became increasingly anti-colonial and an African nationalist. He joined the African national Congress (ANC) in 1943 – he eventually became its President in 1991. In 1948, South Africa’s ruling National Party, which was all-white, established apartheid, the system of legal, racial segregation. Mandela and the ANC were committed to overthrowing the National Party, first non-violently, then using force. In 1961, he helped to create the Umkhonto we Sizwe, “Spear of the Nation”, which led a sabotage campaign against the government. He was arrested and imprisoned in 1962 and sentenced to life in prison. 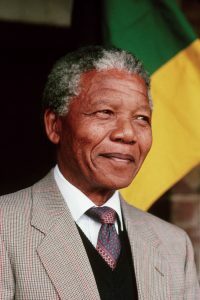 Mandela served 27 years in prison before being released in 1990. Upon his release, he worked with then president F.W. de Klerk to end apartheid. In 1994, he was elected President of South Africa, the first black person to assume the office. After one term, he refocused his energies on the AIDS/HIV crisis in Africa. A controversial figure, both on the right and left, Mandela’s life and his commitment to equality cannot be understated. As to who moves on, I see Nelson Mandela winning, albeit not in a blowout. Here’s why: it’s hard not to root for a guy who fought against racial segregation. It’s hard not to be inspire by a man who went to jail for almost three decades and, rather than being disillusioned with life and giving up, became South Africa’s first black president. His life, even with the controversies, is remarkable. Time zones, despite a valiant effort, will be relegated. Certainly, they are important and have improved our lives considerably, but I see an IMMENSE upset here. Sean: You shouldn’t be so devoted to the rankings in making your assessment. Upset or not, you are right to say that Mandela is more important here. For as much as I enjoy pontificating on the idea of time, the fact of the matter is that local times have always existed and standardizing to facilitate commerce and communications was only a natural step in the march of capitalism and isn’t as influential what Mandela accomplished. 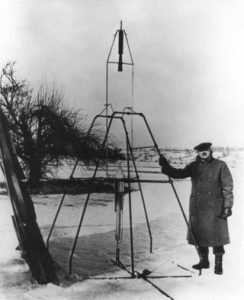 Sean: On the 7th of November, American Robert Goddard, a rocket pioneer, used a music stand as the platform to demonstrate that a tube-launched rocket could be successfully launched. Most of his work in this area came from his work for the Army, where he started working in 1917, and centred on technology that could be used on the front lines during the First World War. One could argue that, as a result, this should be disqualified based on our ‘no war events’ rule. The significance of Goddard’s rocket work goes so far beyond the war, however, that it has to be exempted from this rule. Robert H. Goddard with his first liquid-fueled rocket, March 16, 1926, Auburn, Massachusetts. Goddard first started to explore the practicality of using rocket propulsion to reach high altitudes in 1912. An ambitious scientist, he actively pursued a rocket that could make it to the moon. During his life, however, a lot of his work was used for militaristic purposes. His research into liquid propellant rockets foreshadowed the technical details used for V-2 missiles, including gyroscopic control, steering by means of vanes in the jet stream of the rocket motor, gimbal-steering, and power-driven fuel pumps. While a lot of this work came in the 1920s, the technology he demonstrated at the Aberdeen Proving Ground in Maryland was a basic concept for the bazooka, which has been such a prominent weapon used in warfare since the Second World War. It wasn’t until after his 1945 death and the rush to get into space that Goddard’s work was fully applied – and appreciated – for its innovation in flight and fuelling the human desire to leave the planet. Another one that could be considered in the First World War category, the Manifesto to the Peoples of Estonia was issued on February 24, 1918. At the time, German troops were occupying more of Estonia, filling the vacuum that had been left by retreating Russian troops. The Germans never recognized Estonian independence during the occupation, but with the war’s end German troops started going home. The Red Army saw an opportunity to establish another Bolshevist power and invaded. The Estonians did get some help from the British and Finnish through the ensuring War of Independence, but it was ultimately the Estonian government that managed to successfully withstand the Russian offensive. Following the January 1920 armistice, Estonia was fully recognized as an independent republic and joined the League of Nations in 1921. For this one, I think I have to go with Goddard. When you start reading about Estonia, it really seems like a cool, progressive place with its universal health care, longest-paid maternity leave in the OECD, and internet elections, but I am going to use the population theory here. In its 2011 census, it had a population of 1,294,455. The practical application of rockets, however, has had a tremendous influence on a far larger number of people. From the increased deaths through military use to the expansion of space exploration on our daily lives, improved rocket technology has had a global influence, for both good and bad. Aaron: Internet elections?!? For this alone Estonia should win, right?!? Sean: A couple years ago, a new Tarzan movie came out, prompting multiple think pieces about how the character had far outlived its usefulness. Most of the criticism centred on the colonialism that surrounds the character – he is, after all, a British man who was orphaned and raised by gorillas in Africa and, in most of his film incarnations, saves the locals. That tradition started in 1918 with Tarzan of the Apes, a silent film where Tarzan’s parents die, he grows up, meets Jane, and avenges the death of the Great Ape Kala, and is appeased by the local villagers. The film was so popular that a sequel came out just under 9 MONTHS LATER. In The Romance of Tarzan, Tarzan and Jane set sail for England before being attacked by natives. Lather, rinse, repeat. While the films rely on colonial tropes, the fact remains that Tarzan has been featured in around 50 Hollywood movies and has influenced generations of filmmakers and audiences. 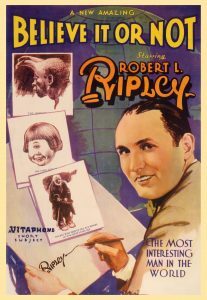 Another cultural phenomenon, Ripley’s Believe it or Not, got its start on December 19, 1918 when Robert Ripley’s first newspaper was published under the name ‘Champs and Chumps.’ Renamed ‘Believe it or Not’ soonafter, the cartoon highlighted strange, odd, miraculous, and awe-inspiring things from around the world. Growing up, Ripley was described as a different type of kid who stood out from the crowd. He got his first job drawing cartoons at a newspaper when he was 16. His interest in travelling and discovering unique things around the world led to him highlighting the hard to believe in his cartoons. From the cartoons, we now have museums, aquariums, books, and multiple television series dedicated to these same principles and attracting millions of visitors annually. This is a tough one for me, but I think I might have to go with Tarzan on this one. This should not, of course, be taken as support for the character and its inherent problems. Instead, I think the films have had a greater influence than Believe it or Not. While both have grown into significant cultural products that have made a lot of money for a lot of people, Tarzan introduced something new to the silver screen where Ripley highlighted things from around the world. While both were innovative in their own way, Tarzan has the edge for me. Aaron: Without Ripley, Dean Cain would not have had an opportunity to entertain us on “Ripley’s Believe it Or Not” television program in the early-2000s. Also, I have not seen a single Tarzan film and do not really plan on seeing one in the future. For this reason alone, I am going with Ripley’s column. Sean: Isn’t Dean Cain a point against Ripley? I mean if Superman has fallen all the way to pseudo-reality television on Fox Friday nights, that’s not a good sign. Aaron: I guess, especially considering that Hollywood has run out of ideas and a new Tarzan movie is likely in development. Aaron: If you’re reading this bracket on your phone, you can thank Alfred J. Gross for being able to do so. Born in Toronto on February 22, 1918, Gross had a lifelong fascination with all things related to radio. 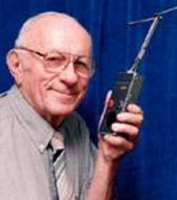 The first walkie-talkie was invented by Donald Hings in 1937, and soon after Gross patented his own version. After WWII, Gross founded the company Gross Electronics Company and produced Citizens’ Band (CB) radios. In 1949, he adapted the two-way radio system and essentially invented the first telephone pager – although no one seemed interested in it at the time. Although pagers are now for the most part obsolete, they played a major role for many professions, such as doctors and drug dealers. Gertrude B. Elion was born in New York City on January 23, 1918. When she was a teenager, her grandfather died of cancer, which motivated her to do all she could to eradicate that disease. She earned a degree in chemistry in 1937, and a M.Sc. in 1941. Due to gender bias, which was prevalent across the United States, Elion was repeatedly denied entry into the PhD program. Despite no doctorate, Elion worked for the National Cancer Institute, the American Association for Cancer Research, and the World Health Organization. 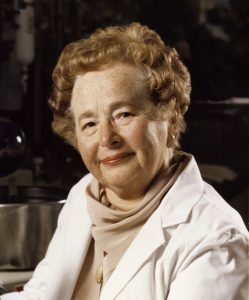 Between 1971 and 1999, Elion was affiliated with Duke University, where she worked on several ground-breaking drugs to combat cancer. In 1988, Elion shared the Nobel Prize in Physiology or Medicine with George H. Hitchings and Sir James Black. Along with Hitchings, some of the drugs Elion helped to develop combatted: leukemia, malaria, organ transplant rejection, and herpes. In 1989, she was awarded an honorary doctorate from the New York University Tandon School of Engineering. In my humble opinion, Elion wins this round. Science has been male-dominated but women have made some major contributions. Elion’s work on advancing AIDS medication is noteworthy, especially for all of the people that the drug helped. Plus, her Nobel Peace Prize is proof that girls can aspire to do anything, too – like how my 2-year old daughter has informed me that when she grows up she is going to live in a parachute so that she can touch the moon and the stars. 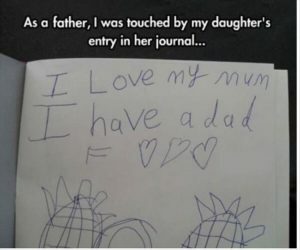 Sean: You mean the daughter that wrote this? Fair enough, but I am a historian of radio and I will not sit here idly while you denigrate my career and say it’s not important. Radio was a truly revolutionary force and all those on the ground floor fundamentally shaped its development. This isn’t to take anything away from Elion, but I just wonder if Gross’ contributions reached a wider swath of the population. Aaron: Me denigrating your area of expertise and discipline is nothing new, Dr. Graham. Aaron: Every year around this time, we are subjected to flu season. And with each flu season comes the coughing, sneezing, aches and pains, which are accompanied by tissues, chicken noodle soup, and Netflix on the couch. 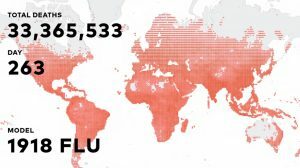 Around the world, between 3 and 5 million people catch the flu, and between 250,000 and 500,000 cases result in deaths, mostly young children and the elderly. Thankfully, the flu shot has been mostly successful in preventing mass infections and deaths. This, however, was not the case in 1918. The Spanish Flu, the H1N1 virus, inflected approximately 500 million people around the world, even on remote islands in the Pacific Ocean. The Spanish Flu resulted in a staggering 50 to 100 million deaths – far more than all the deaths caused by the First World War – which represented approximately 3% of the Earth’s human population. Most notable was that the flu killed otherwise healthy adults. The exact location of the outbreak is inconclusive, but pathologists have suggested that it originated in military camps in France. With the poor health conditions caused by the War – malnourishment, lack of medicine, overcrowding in hospitals – the flu was able to spread quicker and infected more people. Overall, more people likely died as a result of the Spanish Flu than the Black Death in Europe (1347-1351). Despite the incredibly high number of infections and deaths, the Spanish Flu remains a relatively unknown event for most. This is likely because of the tragedy of the First World War (1914-1918) and the Second World War (1939-1945). With hope, virologists are able to determine the exact cause and we can prevent another devastating flu season. The extinction of species is part of life on Earth. Scientists have estimated that approximately 5 billion species that have ever lived on Earth have gone extinct. And with a rapidly changing climate caused by humans, more and more species are going extinct each year. Such was the case of the Carolina Parakeet. 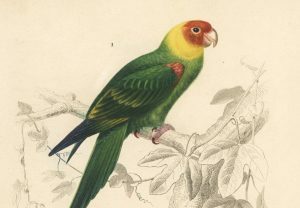 The Carolina Parakeet was one of two parrots native to the United States, the other being the thick-billed parrot. Its native range was the eastern seaboard to Colorado, and south to the Gulf of Mexico. A number of factors led to its extinction, such as deforestation and other human activities. The last captive specimen, Incas, died at the Cincinnati Zoo on February 21, 1918. Unfortunately, no scientific studies exist on the Carolina Parakeet. As for the more historically significant, this may be one of the most lopsided matchups we have ever had in the history of this bracket. The Spanish Flu, I believe, wins in a blowout. This was a catastrophic event in the twentieth century, as it added to the already inflated death tolls brought upon by the Great War. Even more so, it showed how interconnected the world truly was. No longer were people in remote areas safe from the spread of diseases. I am honestly surprised that more people are not aware of the Spanish Flu considering how devastating it was; but it is understandable considering that it was overshadowed by the War. Sean: I’m not going to argue with you over the importance of the Spanish Flu and the epidemic it created. Where I will take issue, however, is the complete dismissal of the Carolina Parakeet extinction. While the bird was known by some for its disagreeable singing voice, it was a beautiful bird. Perhaps more importantly, its extinction is part of a larger process through which we are killing birds at an alarming rate. It’s so bad that even our memorials have to change because we have designed them in a way that hurts our flying friends. So this story isn’t just one of the Carolina Parakeet, but of the entire bird community. And if that isn’t enough, scientists think they will be able to reanimate the birds. So extinct may no longer mean extinct. That is incredible. Aaron: Human deaths versus bird deaths. It’s amazing you’re still single my friend. Scientists may be able to de-extinct a bird; you cannot de-die a person. Sean: Don’t tell Ted Williams. Sean: Well, the Spanish Flu tried to killed everyone, but failed to do so. All the birds died, so…success? Sean: From the early 17th century, the House of Romanov was the reigning dynasty in Russia. That reign came to a close when Tsar Nicholas II abdicated in March 1917 and the family was imprisoned. The night July 16, 1918, members that were imprisoned were executed in Yekaterinburg. The Bolsheviks were not entirely forthcoming about the execution, with official Kremlin releases ranging from blaming left-wing revolutionaries for their murder to claiming that they were still alive. When the deaths were finally acknowledged in 1926, the one consistent component was that Lenin and his cabinet were not responsible. When the burial site was found in 1979, it was not publicized until 1989 and a new investigation launched in 1993, although nothing ever came of it. Regardless of what came after, that July night will forever be associated with the end of the Romanov dynasty. Just over a month later on August 30, 1918 Vladimir Lenin was speaking at a factory in south Moscow. As Lenin was leaving Fanya Kaplan fired three shots, two of which struck him. Kaplan was a member of the Socialist Revolutionary Party who believed that Lenin was a traitor to the Russian revolution, a feeling that was cemented when the Bolsheviks banned her party. Following the shooting, Lenin had doctors treat him at the Kremlin, fearful of leaving the secure site in case there were more would be assassins. 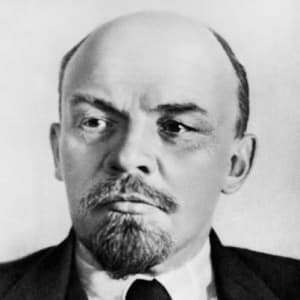 The doctors were unable to remove the bullets outside a hospital, but Lenin was able to recover, although the damage has been widely considered to be a contributing factor to his death from a massive stroke in 1924. (Although there are some doubts about this) For her part, Kaplan was arrested and took sole responsibility, although there are theories that she was working on behalf of others. Either way, she refused to give any details outside her prepared statement and was executed on September 3, 1918, only a few days after the assassination attempt. In this one, my vote is going to go to the Lenin assassination. The deaths were brutal and violent and certainly marked a landmark moment in Russian history, but to some extent the family’s symbolic end had come over a year earlier. For Lenin, however, the assassination attempt helped fuel his paranoia and, potentially, hastened his death. For that reason, Fanya Kaplan’s shots have the edge for me. Aaron: I agree with you here, Sean. The Romanovs had lost all power and influence in Russia – but that doesn’t mean they needed to be killed. 1918 wasn’t 1789 after all. Had Lenin actually died at the hands of an assassin in 1918, however, the Russian Revolution may have experienced a drastic turn of events. Aaron: The calendar that we are most use to is, of course, the Gregorian Calendar, which was adopted in 1582 and named in honour of Pope Gregory XIII. The Gregorian spaced leap years to better align with the Earth’s revolution around the sun. Before this, the Julian Calendar was in use across much of Europe – named for Julius Caesar who introduced it in 48 BCE. By the twentieth century most countries had stopped using the Julian Calendar and instead adopted the Gregorian Calendar; a notable exception was the Russian Empire. Russia did not change to the Gregorian Calendar until February 1918. Once adopted, the date jumped from January 31 to February 14. With the change, certain events also take on new “meanings”. The Russian Revolution, which began in November 1917, is often referred to as the “October Revolution,” because it took place in October 1917 in the Julian Calendar. Most notable, of course, is all the birthdays that were skipped. Millions of Russians, born between February 1 and 13, were unable to age another year. As such, they had to wait another calendar year – a NEW calendar year – in order to age properly. Think of the birthday cake industry; it was a bleak period when the date jumped ahead 13 days. Unless you were born in the 1920s, odds are you have used either a typewriter or a computer for word processing. Typing is an essential skill, one that is imperative if you want a job in most industries. And ever since typing was invented, there have been competitions to see who could type the fastest. At the beginning of the 20th century that distinction belonged to Margaret Owen. Born in New York to a Canadian father in 1893, Owen began competing in typing competitions at the age of 17. Between 1915 and 1917, she won four world championships; she lost the 1918 record to George Leonard Hossfeld, 143 to 142. 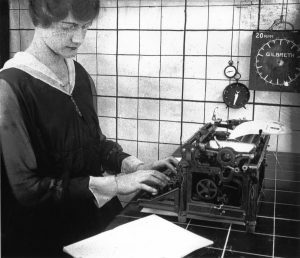 However, on October 21, 1918, she set a new record by typing 136 words per minute; after an hour, she had typed over 8,000 words with minimal errors. I have never used a typewriter, but I can only imagine how difficult that task would be. I don’t know about our readers, but sometimes I can’t type 10 words without making a mistake. In terms of overall significance, and all joking aside, I think that the Russians adopting the Gregorian Calendar is more important for 1918. More and more countries were changing their calendars, and the Russians, who were notorious in the early twentieth century for being “behind the times” (pun intended!) joined many of the other western nations in updating their calendar. This is not to detract from Owens’ accomplishment; it is simply about how many people were impacted by this event. Sean: Joking aside? You’ve been part of each one of these brackets, right? For as much as we complain about the ‘nanny state’ telling us how to live our lives (if I want it to be Friday that should be my right), the calendar is more influential. Margaret Owen had a tremendous achievement, but it didn’t stand the test of time, unlike the calendar which, quite literally, tracks time. Sean: Now we come to one of my favourite annual traditions – me advocating that all things to do with aviation are more important than anything else. A good example of this comes from the HMS Hermes, which was the first ship to be designed as an aircraft carrier. The ship’s keel was laid down in January 1918, although it wasn’t launched until 1924. Prompted by the increased use of aircraft through the First World War, the idea of having a mobile location where crew could launch attacks, maintain equipment, and retreat was incredibly appealing. The ship would serve in the Second World War, where it was sunk by Japanese dive bombers in April, 1942. Despite its end, the ship brought with it a new era of naval operations and changed the face of both nautical and aerial warfare. With civil aviation in the United States, arguably no state has been as influenced as Hawaii. A series of islands in the middle of the Pacific Ocean, Hawaii was pretty isolated from mainland America before aviation. Not only that, the islands were isolated from each other. That started to change when the first interisland flight, a return trip from Oahu to Molokai, took off in March 1918. 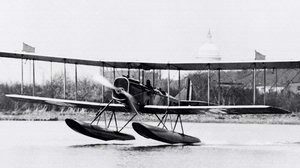 With Major Harold Clark of the Army’s 6th Aero Squadron at the helm, the flight was the first in a series between the islands that were met with a festive atmosphere. Clark would crash land during a flight over the Big Island a few months later, but he was unhurt and the excitement over aviation, and its possibilities, did not wane. While there are certainly downsides to aviation other than the possibility of a crash landing, the economic and cultural possibilities presented by these pioneering flights in a lot of ways transformed not only Hawaii, but the entire world. Aaron: This bracket is rigged! Airplanes versus a thing that CARRIES airplanes?!? No matter what an airplane topic gets through to the second round. Whoever creates these matchups is a monster and a cheater and I want no part of it any more! Sean: In that case, Hawaii flights wins the whole bracket. See you next year everybody! Sean: In addition to everything you said in the first round, have you seen the 30 For 30 documentary about the South African rugby team in the 1995 World Cup that was played in South Africa? Aaron: This seems tough considering we’re pitting a Nobel Peace Prize winner against a guy that can barely express himself… But, I think because more people know about Tarzan, due to the 3,000+ movies made about him, the first film wins this match-up. Sean: I guess, but that Elion isn’t well known isn’t exactly her fault. She was in a male-dominated field where women were (are) marginalized. That she was able to thrive within that environment makes her achievements all the more impressive. That’s even before we start to think about the millions of people who have benefitted from her work. Sean: This is a tough matchup, but I am going to have to go with the Instant Karma of the Lenin assassination attempt. If it had been successful, the Bolsheviks would have been Starting Over. As it was they were Watching the Wheels of the car as it returned to the Kremlin thinking that Lenin was on Borrowed Time. On a night like that, a lot of folks in Russia were wondering How Do You Sleep and were hoping for good news to stave off Yer Blues. For the assassin, she thought she would be a hero, but instead was told Nobody Loves You and stop with the Mind Games. For Lenin, he may have been a Jealous Guy, but he survived to have a Happy Christmas. Aaron: You do know we’re talking about Vladimir LENIN and not John LENNON, right? Sean: Were they both married to Yoko Ono? Aaron: Despite your horrendous dyslexia, I actually think that the Spanish Flu is more significant than the assassination attempt. Sean: I agree. Millions of deaths trumps an assassination attempt, even if it was of one of the most influential figures of the 20th century. I will always advocate for any type of aviation advancement in this bracket. In this case, though, it’s not just for show, I really think that it’s the interisland flights. The advance of trade and communications between the islands was very important in economic and cultural development. We wrote last year about the end of the Hawaiian monarchy and, with it, the dawn of a new era for the islands. The introduction of flights, which was followed by a constantly increasing frequency of travel throughout the islands, was key in that development and should be put through to the next round. Aaron: How many more years of this do we have to do before an aviation event is not listed? Aaron: For that reason alone, I vote Calendar. Aaron: What month is it? Aaron: I really like how this matchup came about: birth versus death. You couldn’t rig this matchup if you tried (Editor’s note: all matchups are rigged). In this case, however, I still have to think that the Spanish Flu was more significant in 1918 than Nelson Mandela’s birth. Millions of deaths, unfortunately, trumps one birth, even if that one birth was of an influential figure. Sean: So if I read this correctly, you are publicly stated your preference for death over birth? But if we look less pro-death, could we not argue that Nelson Mandela was a transformative figure who continually fought for the oppressed in South Africa and around the world. In doing so, he was a transcendent individual who will be remembered long after you and I are long forgotten. Aaron: Certainly. However, the loss of between 10 and 50 million humans in one calendar year is staggering. No matter how famous one person is, I don’t believe that their fame and accomplishments can overshadow mass casualties. Sean: This is real toss-up. On one side you have a strong woman who had a remarkable career and was a force to be reckon with. Over course, on the other side people are not giving the calendar enough credit for its influence and it’s really coming into this matchup being underrated by the fans and media. All that being said, I like Elion here. She is just too much for the undersized calendar team. I do expect the calendar to cover the spread, though. Aaron: Don’t sleep on the calendar! It is extremely well organized and can provide a well-divided attack. Sequenially, up and down the checkered board, the calendar puts out is #1 star first and ends with either its 30th or 31st. Sean: What if they played this game in February? Aaron: February 1918? Or February 1917? Aaron: So long as it isn’t February 1-13 because those didn’t exist in 1918. Sean: Which it should have. So we agree, it’s the calendar. Aaron: You may want to check the score. And with that, the the Spanish Flu Pandemic was the most important event of 1918. Everyone have a safe and happy holiday! !